Stock Interiors is proud to offer the highest quality custom fit automotive Weatherstripping available. 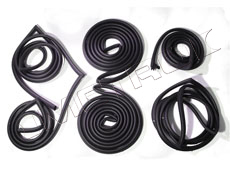 Our custom fit Weatherstrip items are exact replacement foam rubber components and are exact shape of your original weatherstripping. We offer automotive weatherstrip items such as door seals, window seals, roof rail seals, trunk seals and more. Our Weatherstrip items are Guaranteed against defects and Guaranteed to fit right! If you have questions about what items are included, please call us for details. Installation Guide and general information about weatherstripping is available here. Our Weatherstripping items have 10 ratings with an average score of 5 out of 5 stars. Below are our most popular models for custom automotive weather stripping.